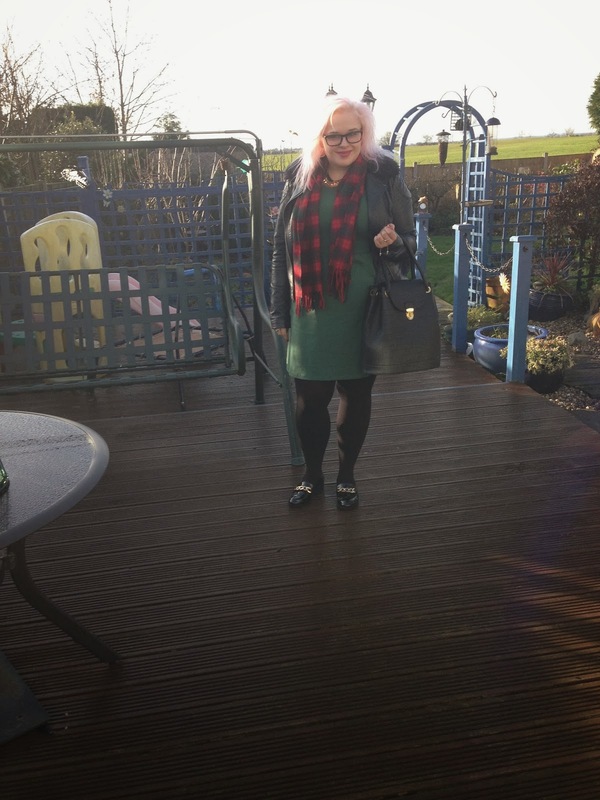 This was my Christmas day outfit so it seems a bit weird posting this now were in January but i love this outfit and i worn this to work a few times. 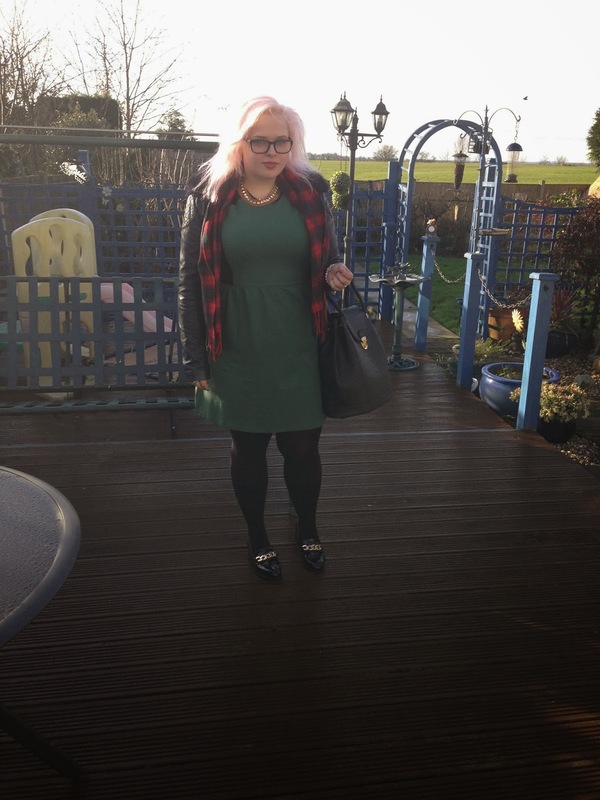 This photo has made me realise how much i miss my pink hair, i only did this for Christmas as i was no brave enough to have pink hair for work. 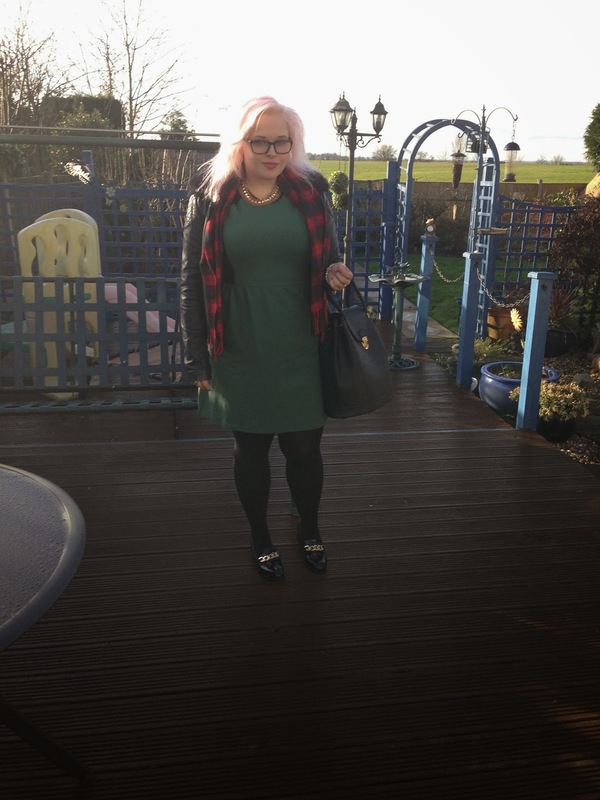 In this photo my pink hair has faded a fair bit as at first it was very bright. I used Bleach London's Rose, i have a 2/3 of the bottle left so i might re-apply in a few weeks. This photo was taken in my Nan's back garden, this is lovely in the summer as the sun as it is south facing. In this photo it has allowed me show my Christmas presents that people had brought me. I love wearing new clothes for Christmas day, its not the same if you don't have any new clothes to pop on. Right after my Christmas dinner i was into my pyjamas so this dress did not stay on for very long. I love this dress, its from Tkmaxx £39.99 my sister brought it me for Christmas but i have secretly being eyeing this up every time i piped into store. I like the length of this dress as its just above my knee so i think this length is perfect for work and smart outings. My scarf is also a gift from Tkmaxx, i love this too. I am not really a fan of big scarfs as they make me too hot so i never wear them, this one is short and is a nice medium thickness so it keeps me warm with my jacket but not boiling. I have worn this scarf with lots of outfits since i got given it, i think it goes with al lot of my outfits already. My bag is from ASOS i have already talked about this is my video post, i have used this al lot for work and i have noticed the handle is starting to break. This is second time this has happened to an ASOS bag of mine, the bag was only £29.99 but i think a bag should last longer than a few weeks. I think i will be sending this back shortly if the damages gets any more as i won't be able to use the bag.